Can solar panels survive hurricanes? But many scientists fear that extreme weather may become an all-too-common occurrence, as the planet struggles to remain in balance in spite of the effects on climate of an exponentially compounding global population. With this in mind, solar and other alternative forms of energy are more important than ever. Key to recovery from the most powerful storm to ever hit TCI was power being restored quickly and safely across the Islands. FortisTCI accomplished that in a extraordinary way. In fact, the Edison Electric Institute (EEI) in January 2018 presented FortisTCI with the association’s “Emergency Recovery Award” for its outstanding power restoration efforts after Hurricane Irma in September 2017. FortisTCI completed full restoration of electricity to its customers across the country on November 6, 2017, less than 60 days following the passing of Hurricane Irma. 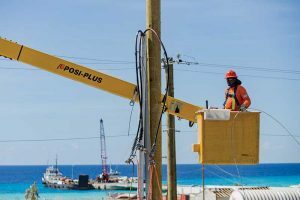 Damage across the archipelago varied, with as much as 90% of the electric utility infrastructure destroyed in some places like Grand Turk and Salt Cay. The massive response by FortisTCI was supported by parent company Fortis Inc. and the Fortis group of companies across the USA, Canada and the Cayman Islands. Key to recovery from the unprecedented 2017 hurricanes were award-winning efforts by FortisTCI. Shown here is a linesman in Grand Turk. According to FortisTCI President/CEO Eddinton Powell, the company took the opportunity to rebuild a transmission and distribution network that is stronger and more capable of weathering massive hurricanes, and grid resiliency continues to be an important goal. In the Summer 2016 Times of the Islands, we published “Let the Sun Shine,” an article introducing FortisTCI’s solar energy program. Since then, FortisTCI made strides in integrating renewable energy sources into the grid during 2017 (pre-Irma!). In February 2017, the company signed its first set of Utility Owned Renewable Energy (UORE) Program contracts, one with Mills Learning Institute in Juba Sound and the other with Atlantic Stone/BRM Limited in South Dock. The total aggregate size is 178kW. Both projects were installed and commissioned between May and July 2017. FortisTCI and Green Revolution engineers inspect the Atlantic Stone/BRM Limited solar panels prior to the 2017 hurricanes. FortisTCI plans to integrate 1.2MW of renewable energy on the grid for 2018. This includes a one megawatt (1MW) large-scale, utility-led solar project awarded following a competitive bid process and planned through an MOU signed in 2016 with the Rocky Mountain Institute–Carbon War Room, a leader in creating clean, resilient and affordable energy solutions by working with utilities and governments. The 1MW project will encompass several sites across the Islands. 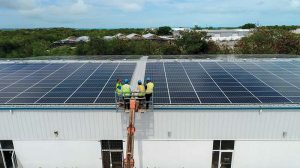 Paul Chaplin and Jim Dunlop are the owners of Green Revolution, a TCI company whose mission is to introduce renewable energy and energy efficiency into the lives of Caribbean people. They focus on ideas and technologies that offer low maintenance, speedy paybacks and are suited to the region’s idiosyncrasies and weather (including hurricanes!) They have been working with FortisTCI on the UORE Program contracts. 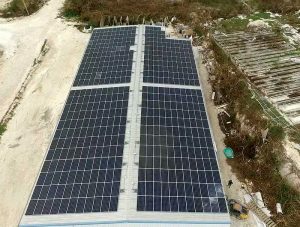 The largest grid-tied solar installation in TCI (Atlantic Stone) sustained minimal damage after Hurricane Irma. Opinion in the Islands is that Hurricane Irma spawned tornados, which can account for the sporadic instances of damage. According to the National Oceanic and Atmospheric Administration (NOAA), when a hurricane makes landfall, it can create ideal conditions for tornado formation. As tropical cyclones begin to die off, the atmosphere becomes unstable as winds near the surface weaken while higher altitude winds remain strong. That instability, paired with a strong vertical wind shear, can spawn tornadoes. Hurricane-generated tornadoes are often weaker, says the National Hurricane Center, and typically strike a small, concentrated area. Green Revolution’s experiences support other reports from hurricane-prone areas. Hurricane-force winds can damage solar panel installations in several ways. Rooftop solar panels can be blown off by wind blowing between the roof and the panels. Vendors ensure systems are designed to withstand uplift forces by fastening panels to the roof beams with large lag bolts. As long as the roof itself was properly built and maintained, there is little chance of solar panels tearing the roof off your house due to uplift or other wind forces. Testing by solar manufacturers includes a certification that the panels can withstand winds of up to 140 MPH, the equivalent of a Category 4 hurricane. In real-world performance, there are reports that nearly all solar panels that were in areas hit by Superstorm Sandy (2012), Hurricane Michael (2016) and Hurricane Irma (2017) survived the high winds with few individual panels damaged beyond functioning. Any other losses were due to the destruction of an entire roof or structure. Hurricane Maria’s path through Puerto Rico has given insight into the durability of solar energy systems as well. A 645kw rooftop solar array on San Juan’s VA Hospital installed in 2015 continued to operate 100% post-storm, even though it was exposed to 180 MPH hurricane winds. What kept this system intact? The racking and anchoring systems used to keep the solar panels in place were the ultimate factor in determining wind resiliency. By utilizing flexible racking devices, the system was able to work like a chain link fence to bend under stress rather than staying rigid and eventually breaking. If you are considering a roof-mounted solar system, be safe in the knowledge that if designed and installed correctly it can withstand the forces of a major hurricane, and in some cases provide an additional layer of protection to your existing roof finish.